United Way of Sumner County improves lives by mobilizing the caring power of the community to advance the common good. If you are looking for assistance, please visit our GET HELP page. If one of these building blocks is removed, the rest of the blocks will topple. The stronger the support between these blocks, the stronger the community will be. United Way of Sumner County uses this approach to ensure its partner agencies receive the support and funding they need to succeed and have the greatest community impact. In 2018, United Way of Sumner County allocated over $664,701 to 32 partner agencies serving Sumner County, the Middle Tennessee 2-1-1 helpline, and donor-directed designations to non-funded agencies from funds raised during the 2017 campaign. With the help of funds raised by United Way of Sumner County, these agencies assisted more than 46,000 Sumner County residents during the previous year. United Way funds helped meet critical needs such as: emergency food, clothing and shelter, as well as addressing the root causes of community problems including: drug and alcohol abuse; teen suicide; life skills for children, youth and new parents; domestic violence; and lack of educational opportunities. Funds are distributed through a review process overseen by the United Way's Executive Allocations Committee. The Executive Allocations Committee is comprised of volunteers from across Sumner County, who are trained in reviewing health and human services operations. Additional volunteers are recruited each year to assist the Committee by attending the presentations made by agencies applying for United Way funding, as well as the funding decisions themselves. United Way of Sumner County makes periodic public disclosure on the amounts of funds raised in each annual campaign and how those funds have been dispersed. Each Sumner County resident can have an impact. Consider contributing to your workplace campaign and if you have time, to volunteer with United Way or one of our partner agencies. If you have a cause you are passionate about, speak out or help someone else find their voice by being that voice. Living United means joining with others in working together to advance the common good. For more information on hosting a workplace campaign or becoming an individual contributor, please contact United Way at (615) 461-8371. 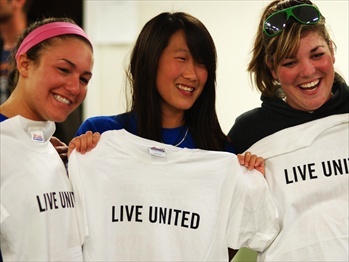 GREAT THINGS HAPPEN WHEN WE LIVE UNITED!